Redheads are on the agenda at the next Unicode Technical Committee meeting, hosted by Apple next week. A new proposal (PDF) from the Emoji Subcommittee seeks to clarify which approach Unicode would prefer to take when it comes to implementing a redhead emoji. The lack of a redhead emoji has been the most frequent complaint from Emojipedia users in the past three months, and this document aims to move the discussion forward on how this can be addressed. Above: A redhead emoji would be simple to implement, but would it be enough? Image: Apple/Emojipedia composite. Possibilities available to Unicode range from a new "person with red hair" emoji (which would likely come as a man and a woman); right through to custom hair "tags" which could be applied to any existing emoji, such as the runner, dancer, or facepalm. Above: One option being assessed involves a new skin tone, which would have pale skin and red hair. Image: Emojipedia mockup. 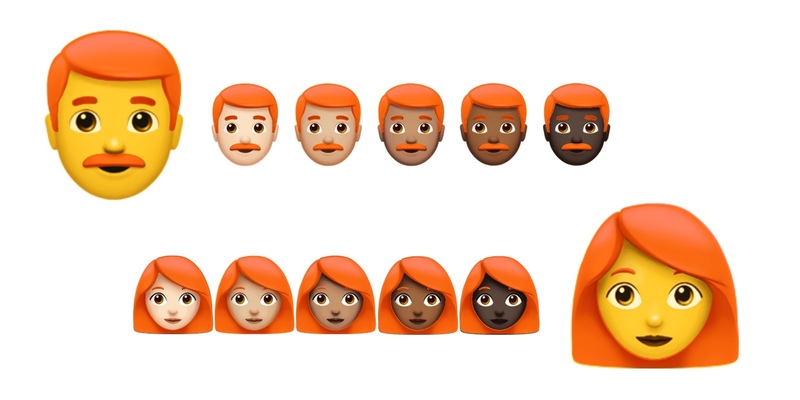 With a slim 1-2% of the population having red hair, it's yet to be determined if this would justify every emoji having a redhead version made available. Also undetermined is whether an implementation which limits redheads to a single redheaded man or woman emoji would satiate demand. Above: A hair color tag option would permit red hair on any emoji and skin tone combination. Image: Apple/Emojipedia composite. It should be noted that no formal decision has been made on whether a redhead emoji should or would be approved at all. The outcome of this discussion may shed more light on if this will happen, and if so, how extensive the redhead support will be. With Unicode 10.0 just months away from release, the redhead emoji would likely appear in 2018 at the earliest.